The Chilli burger is still as good now as it was a year ago. So many great things have happened since my first post on the Meatwagon early last year. I’ve visited countless times, and even ran into Yianni at the Verdugo Bar in LA last summer. I was on holiday. Yianni was doing research. He’s a guy that has taken a detailed, systematic and yet unendingly passionate approach to this project, and after visiting the #MEATEASY twice, I’m starting to wonder what state his empire will be in this time next year. Of course the ‘wagon was stolen, which we all know. But out of the darkness comes the light. At Meateasy there are door guys, and burgerettes, and a full menu and a roof and an amazing bar and decor and one of London’s most mid-Atlantic atmospheres (this place feels like it’s in New York, not New Cross). Quality hasn’t dropped. Whatsoever. The Chilli burger is still as good now as it was a year ago. They’re not standing still either: the fries and macaroni cheese have improved significantly over the last week. Music, ambiance, quality of booze. All fantastic. 3. It’s not a restaurant! You cannot turn up at 8pm and expect to eat in a timely fashion. If at all. The same rules apply now as they did with the ‘wagon itself - turn up on time, or early. For the Meateasy, that means 6pm. Check your expectations with your watch. I think this is something that needs further discussion. As mentioned earlier, it’s now been a full year since Yianni showed up on the food blogger radar. Since then, he has properly crossed over into the mainstream with traditional media coverage, almost universal online admiration and among certain circles, has become a bonafide household name. This isn’t going to stop. But what of the others? Where are the other street food entrepreneurs? The other guerilla dining obsessives? Visiting LA last summer, there were dozens of foodtrucks catering to every cuisine and culinary whim you could think of. And they’re still multiplying like rabbits. It’s the same in San Francisco and the East coast is rapidly catching up. 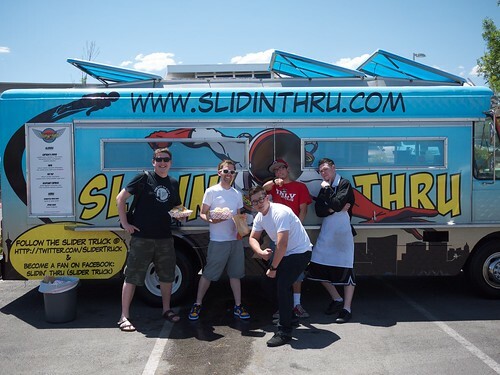 They’re all a pretty amiable bunch too, since cultivating an online following is key to foodtruck success. For example, I felt genuinely proud to be Slidin’ Thru’s first customer from the UK. At the time they were nearly all startups. They’d been open for two to three months, maybe. Tops. And there were dozens of them, with an enormous crowd of cash-ready, media-savvy customers following them around the city, wanting a new favourite dish. Even the old hands, such as Kogi BBQ (five trucks, three locations per day each, five days a week), have turned into full-on empires without relinquishing their values and food quality. It’s an enviably simple model - find something you can do really well, build a following, then expand. Yianni has clearly done his stateside homework and is building his empire. Not just with food, but with PR, marketing and customer experience. He’s not even behind the grill anymore. He’s front of house at the Meateasy. He’s doing interviews with the Evening Standard and quality checking. So having established all of that, it saddens me a bit that there aren’t any other grassroots street food startups generating the same buzz with amazing food. Somebody should be giving Yianni a run for his money, the same way that all the LA foodtrucks compete with each other (and their brick ‘n mortar-based, venture-backed buddies) to earn the crown of being the best. They’ve already had a reality show doing just that. I will always love what he does and what he has done for bringing proper American food to London after all this time. It underlines our completely British approach to competition when there’s nobody else doing anything remotely similar in the same space. The other question mark with the Meateasy will be what happens when it shuts down in March. Between now and then, a back-of-fag-packet calculation suggests the MeatEmpire will have served way, way more covers than it ever has done before. With that comes the next difficult sequel. How do you go from having created such a special place, with a full menu, table service, a bigger kitchen, electronic ordering systems and all the other elements that add up to their slickest project yet, to then shutting it down and going back to a little van again? And what of the pubs? Surely, Yianni is in the completely unique position of being able to say to any pub in London, from zone 1 to 6, that he can show up with his team and guarantee a horde of big eating, big drinking punters. Most of whom will post about it online. And then bring in even more punters. That surely has to factor in to his long term strategy. I don’t know what’s going to happen next, but I sincerely hope his amazing burgers will be around for a long time to come. And maybe it’s time for somebody else to be just as obsessive and give him a run for his money. But for now, it’s still very much the best burger joint in Britain. And the odds are it will stay that way for a long time yet. NB. This post is not addressing all the lovely people that do a sterling job running London’s supperclubs. This is a food truck rant only. Thanks for understanding! #MEATEASY is running until mid-March above the Goldsmith Tavern in New Cross, SE14.